Did you know Americans consume an average 130 pounds of sugar a year? See this infographic. Recognizing that we human beings have an Undeniable Sweet Tooth, I’m sharing two easy recipes for healthy summer treats. I swapped the type of fruit in one recipe and the type of sweetener in both. What I know for sure is that the treats won’t contain crap like artificial coloring and “tastes like” ingredients. My theory is that maybe the treats also have a lower glycemic load than the original recipes, unless, of course, they’re so damn good that your portions are out of control. Strawberry and Greek Yogurt Popsicle – adapted from a recipe in thefoodiephysician.com. Place strawberries and 2 tablespoons coconut nectar in a blender. Puree until mostly smooth, with some small chunks of fruit. Spoon 2-3 teaspoons of strawberry puree into bottom of each popsicle mold. Spoon about 1 ½ tablespoons yogurt on top of fruit. Keep alternating layers of strawberry puree and yogurt. Place popsicle sticks into popsicle molds. Cover and freeze until solid, about 2-3 hours. This was a quick and simple recipe that did not involve making a simple syrup with more sugar. The popsicles were refreshing. 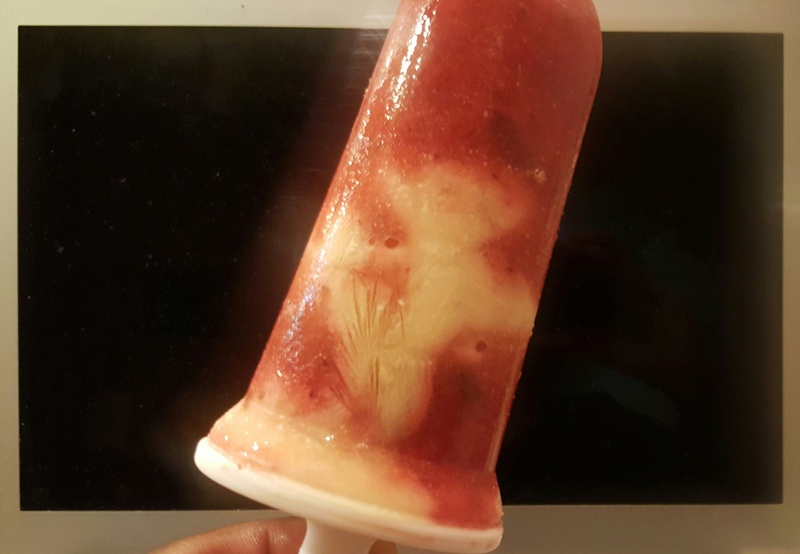 The flavor, like the popsicle construction itself, was alternately sweet and tart. Using plain yogurt instead of sweetened vanilla yogurt reduced the overall amount of sugar in this treat. From prepping the fruit in the pan to putting the crisp in the oven took about 20 minutes. That is real fast for me because I am one slow cook. I adapted the original recipe found here. In the pan, mix together the fruit, coconut nectar, arrowroot starch, lemon juice, cinnamon and allspice. Bake for about 50 minutes, or until the filling is bubbling around the edges and the top is golden brown. Let the crisp rest for 5 to 10 minutes before serving. Oops! 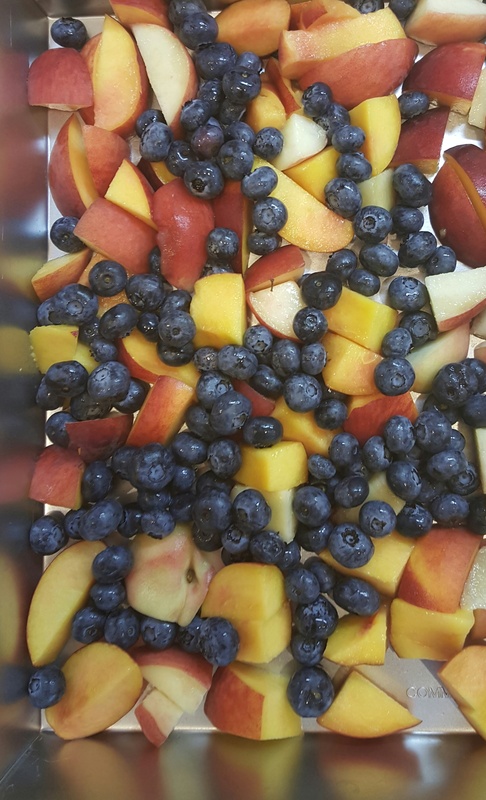 I meant to take a photo of a full pan of the finished peach and blueberry crisp, but then I scooped out a serving for a friend. He went on and on about it, so I had to have a taste myself. 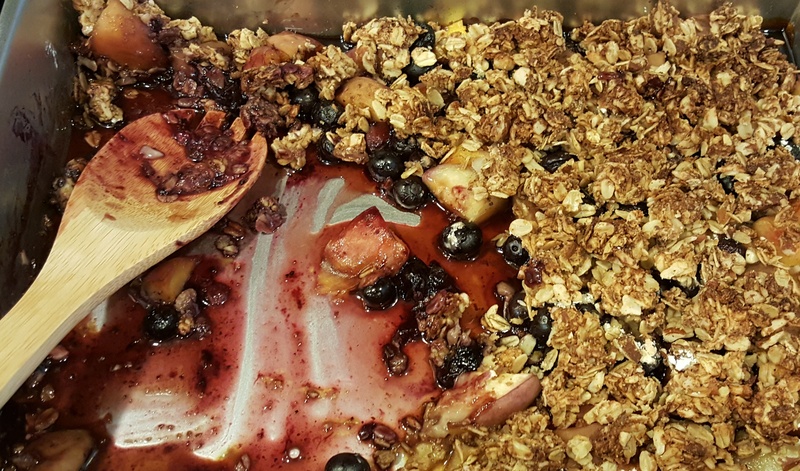 Needless to say, this peach and blueberry crisp didn’t see the next day. Portions were clearly out of control. It was insanely delicious!! Let me know if you try these healthy summer treats. Hope you enjoy them as much as I did! This entry was posted in FOOD NEWS and tagged fruit desserts, gluten-free desserts, healthy eating, low glycemic. Bookmark the permalink.